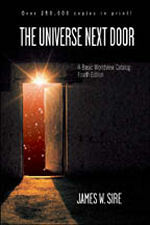 Books | The Universe Next Door: A Basic Worldview Catalog (4th Edition) | Watchman Fellowship, Inc.
Our Price: $15.30 - You Save $1.70! With over a quarter million copies in print in three editions, The Universe Next Door has established itself as the premier textbook on worldviews. In clear, readable prose, James W. Sire expalins the basics of Christian theism, deism, naturalism, nihilism, existentialism, Eastern pantheistic monoism, New Age philosophy and postmodernism. In an increasinly pluralistic academic enviroment, the ability to understand and evaluate various worldviews is vitally important.